Extreme Industrial Coatings deals in high-tech wear protection for metal surfaces and is a production machine shop in Airway Heights, Washington. They have created a specialty product with a very narrow market. They re-manufacture the rotating and stationary valves of the Lockwood Air Cup Potato Planter. This means they target a narrow market of potato farmers – and then narrow the target even more by catering only to those who use the Lockwood Air Cup planter. 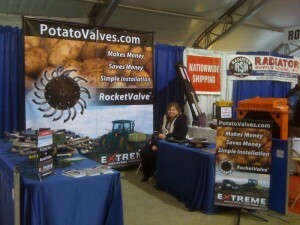 Their strategy has been to search for clients at potato trade shows. In the past, their booth has been very sparse: no banners, no signs – just a display of their products and a black-and-white brochure. This year, they wanted to make a more convincing presence. So they contracted with Cougar Gulch Group, LLC to come up with a new booth arrangement, banners and signs and a new, full-color brochure. We contracted with our partners at CDA Sign for banners and signs and Whitestone Design Werks to design the new brochure. The cooperation, design and product we received from our vendors was top-notch. 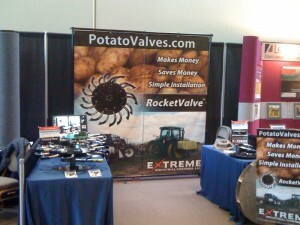 The main show for this year was the annual Washington Oregon Potato Conference, held in Kennewick, Washington. Though the attendance was down a little from last year, the booth was a huge success. Extreme Industrial Coating’s (EIC) message was clear; the signs attracted attention and the brochures inspired the reader to get back with our client. Several orders were secured shortly after the show. The International AG Show in Tulare, California is the largest farm equipment show in the world. This year EIC wanted to make a presence there. So they contracted with Cougar Gulch, not only for design and setup of the booth, but also to man it and produce the leads. Our strategy was not to draw a crowd with give-aways: There are a lot of non-farmers and curiosity-seekers at this show and we were looking for the farmer. Specifically, the potato farmer. More specifically, the potato farmer with the Lockwood Air Cup – most likely less than one-fourth of one percent of the commercial traffic (farmers). The booth was setup the same as had been established at the Potato Conference. We stuck to the message. Although we did have to demonstrate the product to several hundred curiosity seekers, we found several farmers in the mix and walked out of the show with a commitment for a thirty-five thousand dollar order and several leads. The show was a success. Cougar Gulch Group is available to help you with your next trade show. We will design your booth, signage and banners and brochure design and printing. We are also available to demonstrate your product and man the booth for you. We are quite adept at learning products and we have found people come to trade shows to find information – they don’t require every technical question to be answered and are quite happy to give their contact information and be followed up later. This helps you reduce your budget by keeping the expensive people on the job while we generate the leads for you at the show. Call Dean at 208-699-6877 to find out how we can help you with affordable, effective marketing at your next trade show. This entry was posted in news and commentary, project management and tagged affordable marketing, banners, commentary, cougar gulch, effective marketing, extreme industrial coatings, marketing, news, project management, sales representative, signs, trade show, trade show booth, trade show displays. Bookmark the permalink. Both comments and trackbacks are currently closed.